Michael Adam Lengyel, 9781732563216, 194pp. Desire is great. It lures us to take action and seek the truth. Legends say the earth rained manna every day for humanity to consume, a gift by Mother Nature. Just one bite was enough to cure the ill and gain vast wisdom. Once the manna became scarce, humanity waged wars over the remaining leftovers, causing devastation to the planet and their own kind. Pleading to save them from their own vices, Mother Nature created spirits called mannamong to guide them and restore balance to nature. The Mannamong are now considered fairy tales as no one recalls witnessing them for centuries. The book opens with Kali Teal an eight-year-old girl, suffering from an unexplainable illness. In a dream, she gets swept up in the mannamong world and learns from Gisenes, the daughter of mother nature, that a rogue mannamong named Tontorus, is the cause of her illness. Gisenes extracts Tontorus from Kali with her powers and sends her back home. When she awakes, she realizes she is cured. Not sure if it was a dream or not until Tontorus appears in her bedroom threatening to take her as a hostage. What does this mannamong want? How will Kali deal with this menacing spirit? 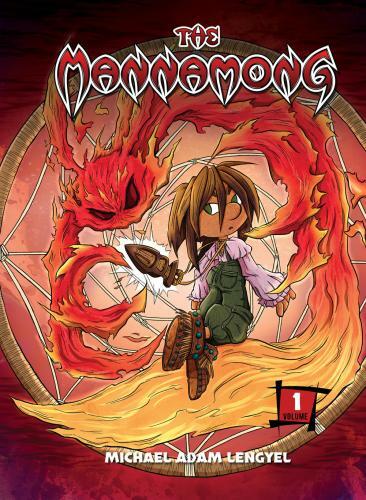 The Mannamong - Volume 1 is the first book in a series of middle-grade fantasy graphic novel that features engaging characters, plot twists, hidden secrets, and subtle humor. The Mannamong series deals with emotions that kids can relate to - fear, worry, doubt, judging others, prejudice as well as hope and trust that all will work out in the end. Michael Adam Lengyel has written and illustrated a story that gives kids a different perspective on how to deal with their emotions in a way that's fun and engaging. Lengyel graduated from Ringling College of Art and Design majoring in Business of Art and Design in 2015 with a passion for visual storytelling. Michael enjoys taking walks outdoors embracing nature while pondering story ideas, people watching and window shopping, cooking and baking, playing games with friends, and loves discussing the art of storytelling and animation. His favorite approach to writing is creating characters with intricate relationships that help shape the story and structure its plot. And if he had one rule to live by it's the belief that "the story is the product's lifeline" which he takes very seriously. But not as serious as a good cheeseburger.